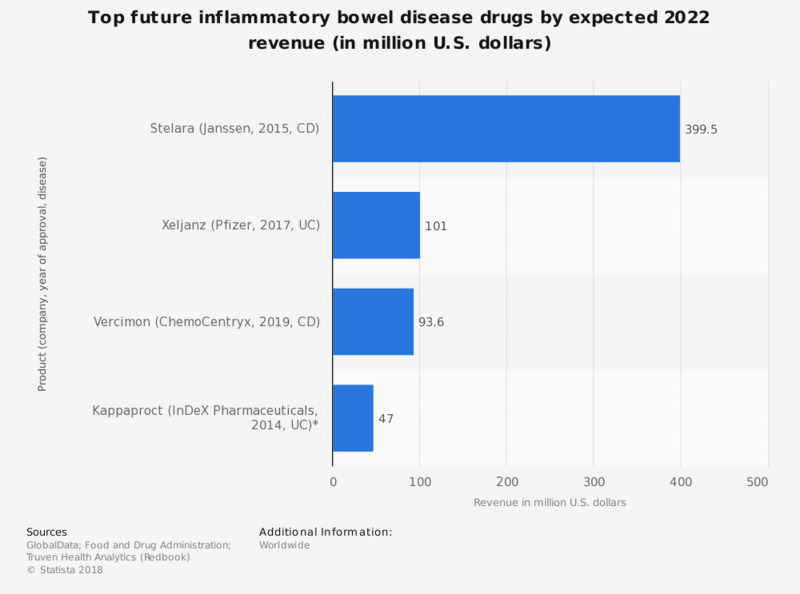 This statistic displays a projection of the top future inflammatory bowel disease drugs based on expected 2022 revenues worldwide. During this time, Janssen's Stelara, a therapy targeting Crohn's disease with expected approval in 2015, is expected to generate 399.5 million U.S. dollars in 2022 revenues. Approximately, 1 to 1.3 million people currently suffer from IBD in the United States, however, the cause of IBD is currently unknown. IBD occurs in the colon and intestine and can also impact other parts of the body. * Only in major 5 EU markets.